When I first began staying at home and started writing, my day was full of blank space. No one spoke to me much during the day and my only son napped consistently for long stretches of time each day. I would spend hours devouring the blogs of homeschool moms, drinking in their knowledge and their days, eager for the time when I would read the classics aloud to my child while he watercolored quaintly in a sun-drenched schoolroom. I would use my alone time to write, to sew, to bake bread from scratch and I made peace with this strange new existence through a dozen other hobbies I pursued. Somehow those days turned into months, then years and I'm there now. I have the sun-drenched schoolroom and a son who watercolors and I read aloud. Only there are three other small people in the room with us. One is using my hair to pull himself up on my shoulders, one is crying because she doesn't like this story and one needs help Velcroing the cape onto his Batman costume. I never imagined a home could be so loud and full of constant activity. We turn from peace to chaos in a matter of seconds and my attention is pulled from one child to the next like taffy being stretched thin over and over again. I've been writing less in the past few months, as homeschooling a second grader and a Kindergartener and managing the younger boys truly wears my brain out. The blank space is gone, replaced by smudged pencil marks and phonics flashcards. I find myself longing for those pre-school days again. When there was enough quiet to be bored and enough peace to think. Oh the irony of looking ahead with such longing only to miss the season you were looking ahead from. I told you I chose a word for the year back in January - ABIDE. I'm not much of an abider. I'd say striving is more my specialty. Constantly seeking out a new hill to climb, I don't always know exactly where I'm headed, but I sure as heck devote serious effort and energy towards getting there quickly. While abiding sounds passive and maybe even weak, I'm discovering that abiding is an incredibly challenging thing to do. 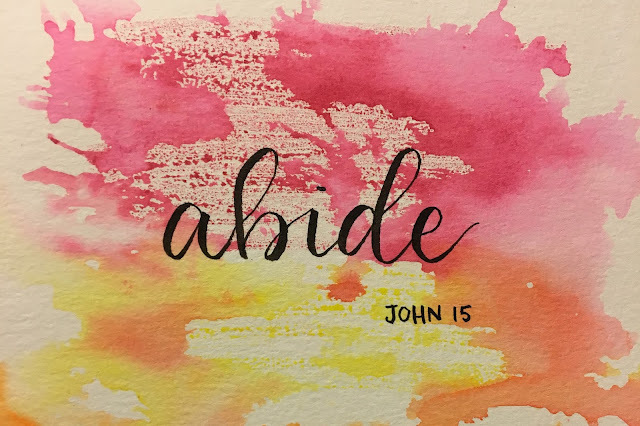 Abide means to wait for. To endure without yielding. To bear patiently. If used in another context it can mean to remain stable or to continue in a place. If I want to bear fruit, the most strategic thing I can do is to ABIDE in Him. If there's any thing I hope to achieve in this season. it's fruit. But with days so full of chaos and noise, I often want to do anything but abide. I want to run away from the mess of mothering. I want a distraction, a temporary success. Something that feels better than making sandwiches for the thousandth lunch and disciplining (the same child, yet again) for the same infraction. Counter-intuitively, I have to lean in to the idea of ABIDE. Abiding in my Lord. Abiding in this home, this calling of homeschool and of mothering. Trusting I am not missing out on greater things. That failing to publish words in other places, failing to grow my blog into a vocation, failing to become something greater in the world outside these walls is not really failure, but a success at something else. Success at waiting patiently. Success at enduring without yielding. Success at remaining stable and continuing in one place. All that to say, I won't be blogging as much this Spring. I do plan to deep-dive into the archives and re-publish some older content I'm sure many of you have never read. I do constantly post snippets from our days on Instagram-stories (I'm @leipprandt over there...) and will continue that as it's easy, requires little brain-space and makes me smile. Thanks for keeping up with me here in this space. Thanks for encouraging me with your words and your emails. I pray that in this season you would know your own calling with a deep assurance and be given the peace to simply and courageously abide. P.S. Thank you sister for the beautiful ABIDE art which hangs in my room and reminds me of what I need to be doing each day.